Yes, it’s true… they’ve only gone and done it! I’m a Celebrity… Get Me Out of Here has made the highly anticipated transfer to the online slot world and none of us will ever be the same again! What's It All About, Mate? The hit UK reality television series has pretty much violated every single part of UK living so it is no surprise that online slot developer Microgaming has taken the step of releasing this slot based on the popular series that sees Z-list celebrities being dumped in the Australian jungle having to fend for themselves and complete a number of daring tasks in order to win food and benefits. Luckily, you won't find Alfonso Ribeiro (Carlton from the Fresh Prince to his friends) in a wet t-shirt in this slot! Fans of the show will immediately be familiar with the layout of the slot game. The reels on this 5 reel, 40 pay-line slot display the “I’m a Celebrity… Get Me Out of Here” logo at the top and the symbols on the reels include various Australian animals including lizards, scorpions and even the sinister eye of what appears to be either a crocodile, alligator (can’t see its nose to decipher which one unfortunately!) or a snake! Whichever creature it is, its glare is actually quite unsettling. It almost made me not want to complete winning combinations with that symbol! Almost! 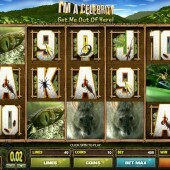 The main bonus in this slot is the Bushtucker Trial Bonus. In the television series, the Bushtucker Trials are the regular tasks that the celebrity contestants must go through to try and win stars for their team. These stars are then converted into food and other luxuries. The tasks often play on the contestants’ fears such as lying in a locked casket with hundreds of insects crawling over them and they try and find stars in the dark or swimming through a pool full of all sorts of nasties in an effort to collect stars. In this slot you trigger the Bushtucker Trial Bonus by hitting three or more of the Star Scatters across the reels. You can win up to 50 free spins during this bonus feature depending on how many Star Scatters they hit to trigger the bonus and you must then choose an insect to reveal a number of free spins and a multiplier. 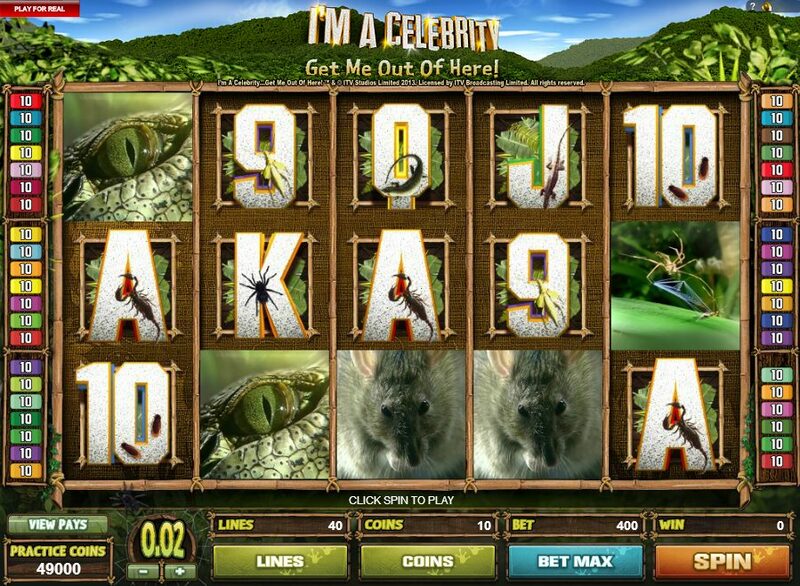 The I’m a Celebrity… Get Me Out of Here logo acts as the Wild and substitutes for all other symbols except for the Star Scatters to complete winning combinations and help to win you big prizes during the regular game and free spins. As is often the case with television show endorsed slots, this game is pretty one dimensional and it does just feel like a marketing ploy. Slots such as Playtech’s camp and cheesy Love Boat and IGT’s 100,000 Pyramid slot actually felt like slots in their own right. Unfortunately, this is slots gaming at its very basic. It might appeal to inexperienced slots players that love the show but that’s really where its target audience ends.